Spring is in the air and the jonquils are in full bloom. For some this means the unpacking of clothes nestled in the attic de-cluttering the junk drawer, but for the community of Osage Point, these spring indications are like a melodic alarm clock to an extended hibernation. Spring in Fairfield Bay is a celebrated occasion, especially in our little corner of the world. This fresh and beautiful season equates the coming together of community in the great outdoors, with every amenity necessary for the perfect season, green-thumbed gardeners, big-kid garage toys, and grill aficionados. • In the garden. Growing your own succulent foods isn’t the easiest task yet it is certainly one of the most rewarding. Consider the task spent peacefully in your own backyard, surrounded by the fruits of your labor. This is an easy reality at Osage Point. • On the golf course, or the ATV/UTV trails. Store your prized golf cart and/or ATV right here in the Toy House. Protected all winter from weather and wear, they are waiting and ready to go with the warmer weather on the horizon. Explore new territory, take the boat out for a spin, or play a round on the green. There’s room for it all! • On the patio, just chilling and grilling. Gather your friends for a crawfish boil. Burgers, brats, grilled veggies etc. 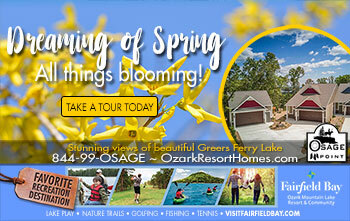 – enjoy the spectacular view of Greers Ferry Lake with neighbors in the spring evenings by simply stepping outside your back door. What a great place to entertain and be entertained. • On the lake. It’s always a great day to be on the lake, no matter the season. Plenty of room to store your boat and/or jet skis could be right here in the Toy House, at Osage Point. They would have been protected all winter from weather and wear, and they are ready to go. • On the highways and bike trails. Get out on the winding trails and byways right here in the Ozark region. Fairfield Bay hosts amazing riding trails… right in our backyard. And where can your bike stay? You’ve guessed it, right here in your Osage Point Toy House. With every feature of these unique homes comes a new memory waiting to be made, nestled in a close-knit community of good friends ready for spring and all of the fun that comes with it. Our homes are moderately priced and affordable. You will have no exterior maintenance expense, plus all new appliances, water heaters, heating and cooling system, LED lighting, and extremely low energy costs make this affordable for years to come. Join Us: Easter Egg Hunt – March 31st. Come experience this thriving community. Bring your loved ones out to our community Easter Egg Hunt! Come on out and meet your neighbors! Talk a quick look at our New You, New Home video. And Learn more about the amazing lifestyle that awaits you at Fairfield Bay, Arkansas.